The Kirlian camera is not a camera in the true sense of the word, as it has no lens. Instead of a lens it uses a positively charged plate (cathode) and a negatively charged point (anode) and sheet film to capture the image. Sheet film is placed on the cathode and the subject is placed upon that. When the subject is placed upon the film it becomes the negative point or anode. 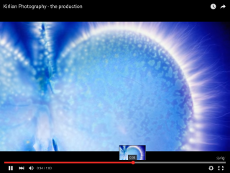 In Kirlian photography we make a high voltage sandwich with the film as the filling! What ever happens between the cathode and the anode will be captured on the sheet film. The resulting image is called a Kirlian photograph. Of course with the development of Fullspectrum’s digitally enabled Kirlian camera all is now captured directly to computer. You can only take Kirlian photographs of subjects you can place on the 21cm x 17cm viewing plate. Hands, feet, crystals, leaves, insects, flowers, fruit, food, liquids, jewelery, coins etc are all good Kirlian subjects. The free electron accelerates towards the subject colliding with the mainly nitrogen atoms in the air causing them to eject their single orbiting electron. During this process a photon of light appears within the visible and ultraviolet spectrum. So when the electrical potential reaches a certain point millions of electrons are pulled out of their orbiting shells colliding with other atoms knocking out their electrons. This mass of activity ionizes the surrounding air creating negative and positive electrical pathways for them to travel. This creates lightening like streamers to appear in the visible and ultra violet light spectrum. This phenomenon is known in physics as a cold electron emission or corona discharge. What interests the Kirlian researcher is how the subject reacts to this highly charged process and how the trajectory of the atoms are influenced by this reaction. It is understood that certain environmental conditions and the physical nature of the subject will affect the radiation field but what has fascinated Kirlian researchers for decades is what unknown forces are contained within this mix. There is much anecdotal evidence to suggest other influences are certainly there which has led many to believe that there is far more to Kirlian photography than understanding conventional Physics.